Paul Bielatowicz – The most eventful one-off gig in Carl Palmer Band history? The most eventful one-off gig in Carl Palmer Band history? After being home for a few days since my last tour with Neal Morse (sorry, I didn’t have time to write a tour diary for that) I set my alarm for 2.45am; allowing me time to drive from my house in Brighton, to Carl’s house in North London for our arranged meeting time of 4.45am. On the previous tour with Neal I had needed a few effects pedals, but had no need for my entire pedal-board set-up so I’d removed many of my pedals from the board and decided to take them separately. Partly for this reason and partly inspired by vivid memories of dragging my pedal board around dozens of airports on my previous outing with the CPB, I decided to remove all of the remaining pedals I needed and take them separately (as I did in my pre-pedal-board days). Being that we were only travelling out for a single gig, I figured that having to set-up my pedals without the board would not give me too much trouble, and if it did, I’d only have to do it once. So, I set off to Carl’s house complete with small suitcase carrying only pedals, leads (or cables for those in the U.S.) and my wash bag (toothbrush, toothpaste, shampoo etc)… case considerably smaller and lighter = me considerably happier. I arrived at Carl’s house just before the designated meeting time and, as I did, I passed Stuart’s car parked up the street from Carl’s house – his usual sleeping spot before our early morning meeting times (Stuart has to travel through the night to Carl’s house every time we do a gig / tour as he lives in Devon – he usually sets off around 10.30 the previous night and takes a few stops to sleep, ending in a final sleep stop when he reaches Carl’s house). A few minutes after I arrived, the car to take us to the airport pulled up outside Carl’s house; I unloaded my bags, drove my car up the street to Stuart’s sleeping spot (where we leave our cars whilst we’re away), Stuart followed in his car after unloading his bags and our airport car pulled up along side us. We arrived at Heathrow airport and made our way to the check-in desk of our Alitalia flight. When I heard that we were flying Alitalia I was a little worried… the band has only ever flown with the airline once; before I joined. 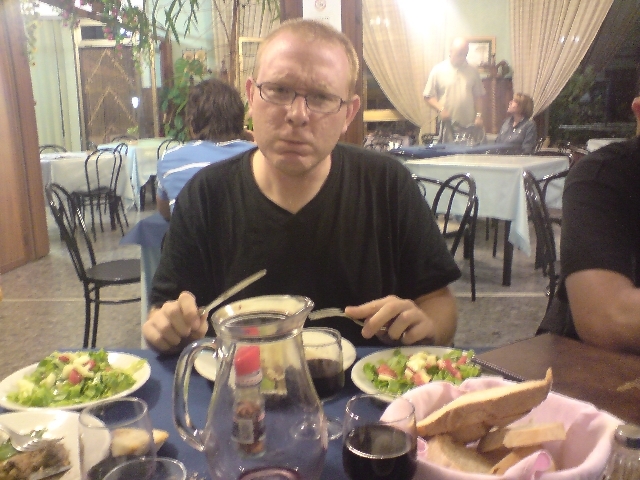 I had heard the story of how Alitalia had lost the previous guitarist’s (Shaun Baxter) pedal-board. I put the niggling thought out of my head and proceeded to the check-in desk. Then I heard that we were due to fly to Milan for a connecting flight to Rome… I pushed new feelings of nervousness away when the friendly check-in lady assured us that our luggage would be checked all the way through to Rome and issued us with 2 boarding passes each; one for each of our 2 flights. After buying a couple of batteries for my pedals (not taking my pedal-board meant that I was also leaving my power supply behind, so I wanted to be sure that I was prepared for all eventualities) we boarded the plane. As we boarded a picked up my free copy of ‘The Observer’ newspaper (a nice touch), sat in my window seat and fell asleep until the air hosts/hostesses served me a cake and a glass of water for breakfast. When we arrived at Milan airport, we had to go through passport control but, due to the fact that we already had boarding passes for our flight, did not need to check-in again. At this point, despite the assurance of the check-in lady at Heathrow that our luggage would be check through all the way to Rome (we’ve been assured before! ), I had a faint nagging feeling that we should check the baggage reclaim belt just in case our luggage had been put there by mistake. Putting this feeling down to a small bout of OCD, I followed Carl and Stuart through security to our gate. …How many times in the past had I resolved to always listen to my little nagging feelings?!! 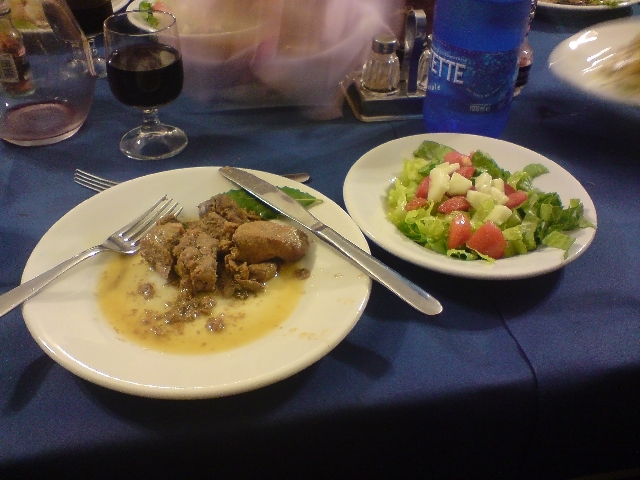 Alitalia had, as we feared, managed to lose the CPB’s luggage once again – a perfect, 100% record; the 2 times the band had flown with the airline, they had lost our luggage! We proceeded to the Alitalia office to register the lost luggage and soon learned, when we joined the back of a queue, that nobody’s luggage from London had arrived in Rome. The people behind the counter seemed very familiar with the procedure; they’d obviously had a lot of experience in these situations, it really did seem like this was a mundane, daily routine for them. We described our luggage, gave them our details and Simone’s (Italian soundman) and Stefano’s (Italian agent) phone numbers so they could contact them when they’d located our bags and left the airport, assured that we would get our bags later that day as flights from Milan (where our bags probably were) were every hour. We went through customs and were met by Simone who took us outside to our awaiting van (the one with the table from the previous tour). 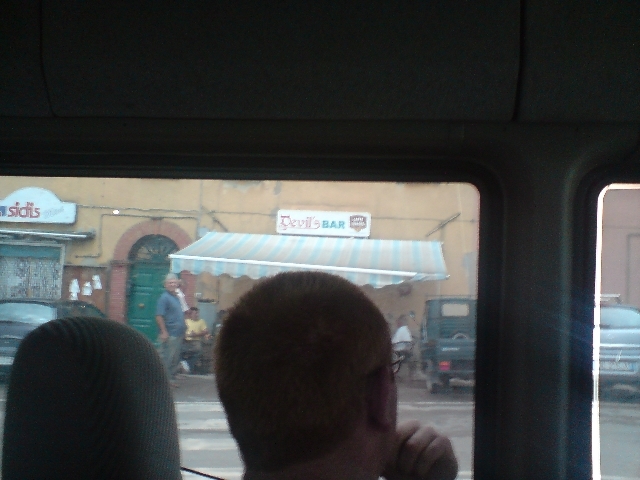 We reached the van to find Gabrielli waiting for us and learned that the van’s air conditioning wasn’t working so we drove to another area of the airport, changed to a van with working AC (or so we were told) and left the airport. After the loss of our luggage, our next obstacle was a broken guitar amplifier; Uli Jon Roth had used the Marshall I was due to be using that night (we were playing the same festival and share the same agent, who’s amp it was) – the amp had blown during his performance the previous night. We set off for Simone’s studio in Rome where we collected a couple of very small, very beaten-up fender combo amps – tonight’s gig was going to be interesting! Whilst I was there, I scoured the studio for any effect-pedals I might be able to use if the worse came to the worse and Alitalia couldn’t find our baggage in time for the show (apparently it took 3 days of sending Shaun Baxter’s pedal-board around Europe before he actually got it back). Finding nothing more than a chorus pedal, I really hoped Alitalia were right when they said they’d have it to us by the end of the day. We left Simone at his studio calling the airport for a progress report on our baggage, and set off for a lock-up garage, somewhere else in Rome, where we collected Carl’s Italian ‘Tamboro’ drum set. I helped whilst Gambrielli did the lion’s share of the work, transporting the drums up a long ramp leading from the underground lock-up garages. As Gabrielli was bringing the last load of drums up the ramp he dropped the handle of the trolley… I couldn’t help but laugh as I watched him desperately chase the accelerating trolley down the long ramp; I don’t think he saw the funny side of it, so I tried to straighten my face as soon as I could! As the last of the drums were being loaded in the van, Simone came to join us with the news that there was, in fact, no news about our luggage. He’d experienced Alitalia before and, based on his experience, asked us what pedals we would need for the evening’s concert. Both me and Stuart gave him a list containing some easily obtainable pedals (distortion, chorus) and some not-so-easy (whammy pedal, envelope filter). We left for the gig, which was about 2-and-a-half hours away, and Simone left for his studio again, where he continued to phone the airline and also anyone he could think of who might own one of the pedals on our list. Before we left, we agreed to erect 2 statues in honour of Simone; one if he could find a Digitech whammy pedal and another if he could find an envelope filter before the gig (on a Sunday). We set off for the gig. About an hour into the journey we became a little concerned about the ominous looking clouds in the sky – tonight’s gig was outdoor, so rain might seriously hamper the whole affair. Half-an-hour later, our fears looked like they might become a reality – by now the clouds had closed in, torrential rain was thrashing down and lightening lit the sky! Undeterred, we continued to the gig. After 2-and-a-half hours of travelling (including the compulsory ‘Autogrill’ stop) we pulled off the motorway and arrived in the town of where we were due to play… to our relief, the rain had eased now, and looked like it would stop soon. Once in the town we saw a poster for our concert and stopped at a local bar / pizzeria to ask for directions. 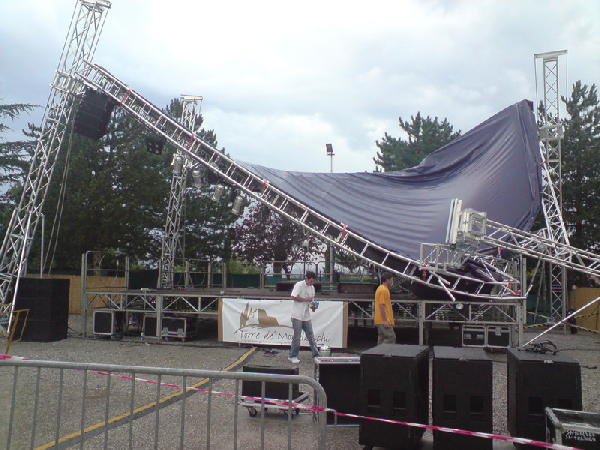 Being a small town, everybody knew where the concert was being held; the first guy Gabrielli asked pointed him in the direction of the stage, adding an unexpected piece of information; “The stage is broken”! “The stage is broken”… what on earth did that mean?… 10 minutes later we saw exactly what he meant! The entire roof, a scaffold and tarpaulin structure complete with lights and speakers, had collapsed at one side. One of the 4 supports that held the roof had toppled over, taking the entire structure with it. 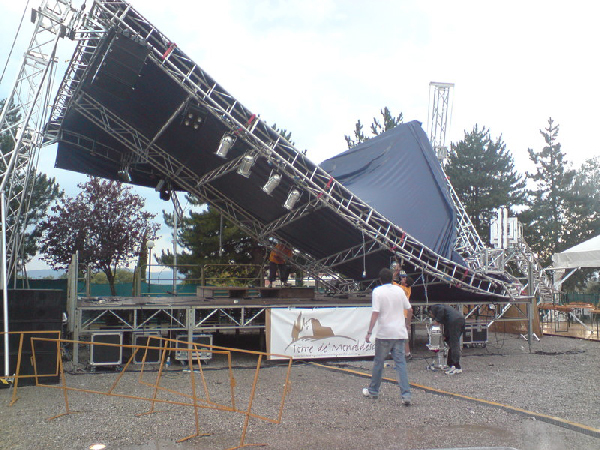 We were told that the concert was canceled – they said that fixing the problem would mean rebuilding the whole stage, which I guess they couldn’t do in time for the gig. 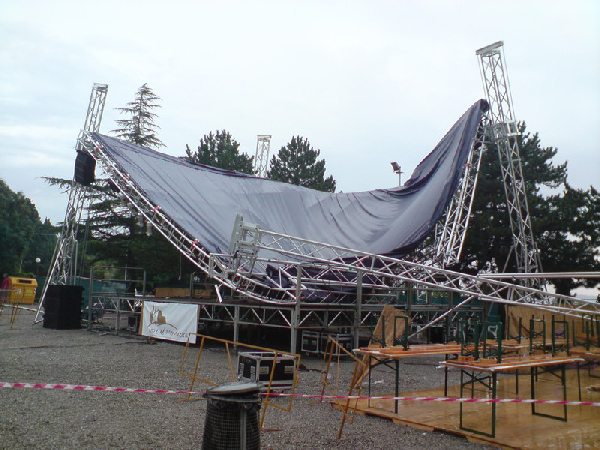 The reason for the collapse was unsure – I was given a couple of explanations; 1 – the rain that had collected on top of the tarpaulin was too heavy for the structure to hold and 2 – the thing had simply blown over… I’m guessing the first reason was the most likely. This was the perfect end to a day crammed full of the most unlikely obstacles and mishaps… we laughed as we sat looking at the catastrophic scene in front of us. I met some people who had come to see the concert, including a couple of young guys who had traveled from Rome to see us. We chatted, took photos, drank red wine (well, mine was a coffee seeing as I still held out a little hope that we might somehow play) and a couple of hours later we left for a restaurant where we ate the most amazing Penne Arabiata followed by wild boar and tiramasu – a long way to come just to have a meal, but it was SO good that it almost justified our journey! After the meal I got out my guitar and played; just so I could say I’d at least made some music. 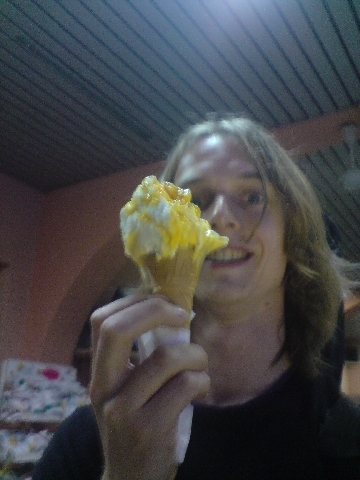 We left the restaurant and went to a local bar where we had the most incredible ice-cream; mine was crème caramel flavour! Just before midnight, the promoter took us to our ‘hotel’; the local school. We slept in what looked like teacher’s boarding rooms, but my bed was soft and that’s all I needed! The following morning we left, still with no luggage… all sorts of responses came to mind when the lady on the Alitalia desk asked us where our check-in luggage was! We checked-in with only our hand-baggage; enjoying the rare experience of traveling light(ish). Tour: Carl Palmer Band – The most eventful one-off gig in CPB history?